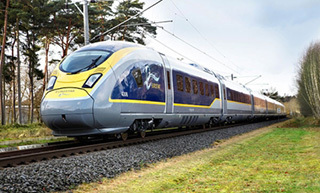 Eurostar, the high-speed rail service connecting the UK with mainland Europe, has officially launched its new service direct from London’s St. Pancras International rail station to Rotterdam and Amsterdam. Eurostar says the launch of the new service transforms the connection between London and the Netherlands. For the first time, pax can travel from the heart of London to Rotterdam in three hours and one minute and to Amsterdam in three hours and 41 minutes, at a speed of about 300 kph. Offering fares starting at £35 (approximately CAD$62) one-way, the new route provides travellers with an alternative to the airlines. Eurostar also makes a case for high-speed rail as an environmentally responsible choice for European short-haul travel, saying the rail journey produces 80% less carbon per passenger than the equivalent flight. Eurostar’s fleet of e320 trains is operating on the London-Amsterdam route and features WiFi connectivity and 300 hours of onboard entertainment streamed to customers’ personal devices. This connecting return journey will be a temporary measure while the governments in the UK and The Netherlands complete an agreement which will enable passport checks to be conducted on departure in The Netherlands as in other key Eurostar destinations. Tickets are now on sale for Eurostar’s new route which has started with two direct services a day departing London at 08.31 and 17.31.